The “Second Week”: Week Twenty-Two/Session Two. Our reading for today: Luke 14: 25-34. Is there anyone here who, planning to build a new house, doesn’t first sit down and figure the cost so you’ll know if you can complete it? If you only get the foundation laid and then run out of money, you’re going to look pretty foolish. Everyone passing by will poke fun at you: ‘He started something he couldn’t finish.’ Or can you imagine a king going into battle against another king without first deciding whether it is possible with his ten thousand troops to face the twenty thousand troops of the other? And if he decides he can’t, won’t he send an emissary and work out a truce? Over the last few blog entries, we’ve been exploring what St. Ignatius calls Election. Author Kevin O’Brien (The Ignatian Adventure) defines this word as, “noble commitments and choices between two or more good options.” It’s obvious from today’s text in Luke 14 that Jesus expected His followers to make some pretty hard choices in life if they truly wanted to remain at Jesus’ side throughout His lifetime. And that’s exactly what Jesus commands us to do as we calculate the on-going costs of being His disciple. So for those of us who don’t like to make hard choices, or maybe you’re like me and you hate to make a decision that might alienate you from someone or not please them, here’s the tough news. Jesus, throughout His lifetime, had to make decisions that eventually cost Him just about everything. His family. His friends. His reputation. His own personal comfort. And finally, His very life. The Master literally walked through hell, and sadly had to do all that on His own, while His best comrades hunkered down, protecting themselves from a similar fate. Jesus even endured the pain and tortured agony of the Cross. And if we read the biblical text correctly, apparently even God, His Father, turned His face away for a moment of time, leaving Jesus utterly alone to face His horrific pain. And all this because Jesus of Nazareth made difficult choices (Election) that had at their base, a gut-wrenching decision to follow God’s Kingdom wherever it might take Him. So when Jesus says that I will need to make some pretty hard decisions in this lifetime in order to remain as one of His disciples, I guess this is where the rubber meets the road. We’re no longer walking in “seeker-sensitive” territory here. No longer talking about a religious experience that tickles my fancy or feeds my need for self-comfort. We’ve now crossed over from the light and fluffy Christianity we tend to peddle to the masses here in America to a down-and-dirty, gut-honest faith that requires little boys and girls to grow up quickly, face the music and join with other saints, who across the ages, have given their all-in-all for the sake of God’s greater glory. My prayer: Father God, it’s painfully obvious that Your Son, Jesus of Nazareth, had to traffic some pretty hard places in order to remain obedient to Your advancing Kingdom. I, too, have been asked by Jesus to be willing to do the same. Holy Spirit, empower and embrace me so that, whatever the cost, I will choose, on a daily basis, to remain faithful to the cause of Your Kingdom. For Your name’s sake. Amen. My questions to ponder: So where is the high cost of following Jesus causing me today to listen to the voices of compromise? 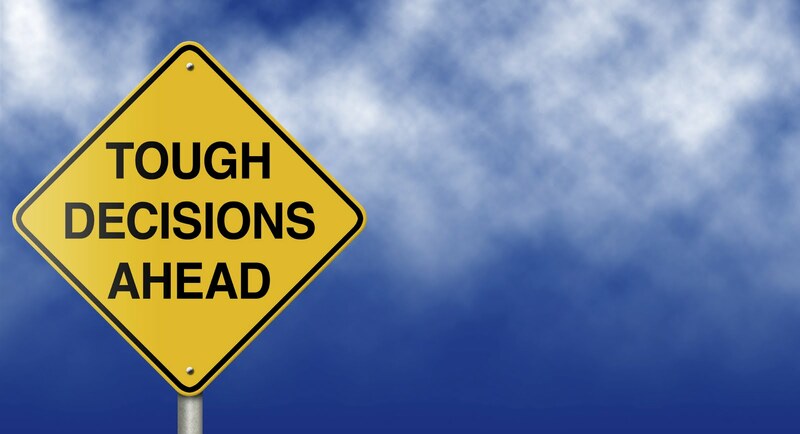 What hard decisions are facing me in this season of my life and how might I come alongside the ways of Christ, making these difficult decisions not through my own strength, but by His?